Sign me up to receive monthly updates from Page Ahead! Page Ahead is proud to present the Sarajane Beal Award for Volunteer Excellence to Diana Konaszewski Ray. As a Story Time volunteer, Diana has brought tremendous joy to her PreK class in Port Townsend, even going so far as to make special appearances in her Pete the Cat costume. Diana’s enthusiasm as she reads to the children is a sight to behold; big- hearted she always takes the time to make sure each small hand is seen and each little voice is heard and responded to. Putting her considerable thrift-shopping skills to use to stock our prop area with fun and interesting items. Created personalized questions for each of our 180+ Story Time books. This has enabled fellow Story Time volunteers to ask their students more questions during their sessions about what was happening in the story, a technique called Dialogic Reading. This technique helps to engage the students with print and to become active participants rather than passive listeners. Diana eagerly took this huge and daunting task on and completed it without batting an eye. Thank you, Diana, for all you do in helping Page Ahead create a love of reading among the children of Washington State; we are grateful for you! 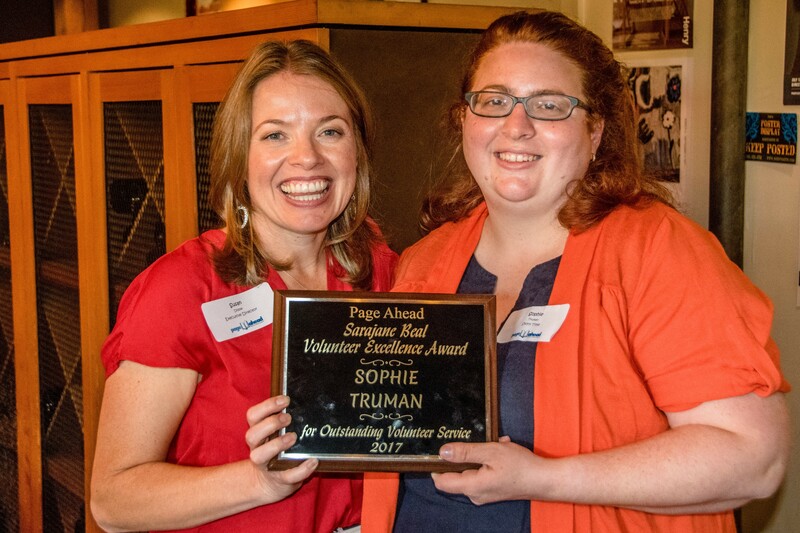 Page Ahead is proud to present the Sarajane Beal Award for Volunteer Excellence to Sophie Lalazarian-Truman. Sophie is a very active and valued member of the Page Ahead family. Sophie is a dedicated Story Time Reader and Volunteer Trainer. In addition, Sophie is an acting member of Page Ahead’s Program Committee and serves on the Story Leader subcommittee She helps select books for the program, assists in creating the program curriculum, and coaches’ teachers participating in the program. Sophie Truman has eighteen years of experience in libraries and early literacy. She has a Bachelor of Arts in English from Scripps College, a Master’s of Library and Information Science from University of California Los Angeles, and has been volunteering with Page Ahead since 2010. Formerly a librarian with the Sno-Isle Library System, she is currently raising a five year old son, whose first word was “Book!”. Pictured (L) Susan Dibble, Pictured (L) Executive Director Susan Dibble, (R) Sophie Truman. Page Ahead is proud to present the Sarajane Beal Award for Volunteer Excellence to María Teresa Vincens. María Teresa can do anything, and has done most everything for us at Page Ahead. A journalist by trade, María Teresa first offered her writing skills to Page Ahead in 2011 volunteering on our newsletter, Chapters. She has gone on to write an article about Page Ahead published in Prime Time. A native Spanish speaker, María Teresa has provided Page Ahead with invaluable translating services turning training materials from English into Spanish. After getting involved with Page Ahead’s Story Time program as a story reader, she realized she had truly found her niche. A fabulous story reader, she also helps train the new Story Time Volunteers, showing them the secrets of her success with the kids. María Teresa’s warmth and humor have enriched our lives as well as our programs here at Page Ahead, and we are grateful to her for sharing her many talents with us! Pictured (L) María Teresa Vincens, (R) Board President Alena Shafer. 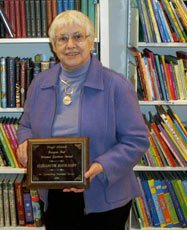 Page Ahead is proud to present the Sarajane Beal Award for Volunteer Excellence to Barbara Towle. Page Ahead’s Story Time program relies on Barbara. Where ever there’s a dancing bug with googly eyes, or a clothespin alligator, it’s because of Barbara! Barbara has been a Page Ahead volunteer since 2008, even recruiting one of her in-laws to join as a volunteer as well! Barbara not only manages all the materials for Page Ahead’s growing Story Time program, she has originated and redesigned many of the crafts, making them age appropriate for preschool age children through kindergarten students. We are grateful for Barbara’s faithful volunteer service. It is no exaggeration to say that Story Times could not happen without Barbara! Barbara is an author in her own right; her first book is a story for children of the unlikely but true friendship between a hippo and a tortoise: How Timbo and Trevor Got Together. Pictured (L) Executive Director Susan Dibble, (R) Barbara Towle. Page Ahead is proud to present the Sarajane Beal Award for Volunteer Excellence to Mark Best. Mark Best is a skilled and avid photographer, and we are fortunate to be the beneficiaries of his talent and friendship. Mark comes to Page Ahead from The Boeing Company where he has worked for 30 years. Giving books to children in need is a fun mission, but Page Ahead needed the means to vividly show the public what we do. Mark expertly fulfills that need by taking portraits, some exquisite, some adorable, of the many children who receive books from Page Ahead. For the last seven years Mark has given us memorable photos of our events and our kids. He does this out of the kindness of his heart – and the occasional doughnut. According to Mark, “Nothing can beat the excitement and joy of a student getting their very own book that they get to keep forever.” It’s time for Mark to come out from behind the camera and into the limelight. Thank you Mark Best for documenting our history, and making it look good. Pictured (L) Executive Director Susan Dibble, Mark Best (C) and Board President Scott Kuch (R). 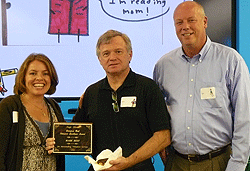 Page Ahead is proud to present the Sarajane Beal Award for Volunteer Excellence to Deb West. Deb is our very own Data Dynamo and is an important part of our organization. The work that Deb does ensures that we can plan campaigns, track information accurately and communicate effectively. Deb has volunteered with Page Ahead for the last few years and we continue to be impressed with her sense of commitment and dedication. She comes to the office almost every week and does not leave until she has completed her tasks. In addition to her regular Page Ahead schedule, Deb volunteers with us before during and after special events. What Deb does is vital to Page Ahead and we truly do not know what we would do without her. Thank you, Deb! Pictured (L) Board President Elaine Denslow, (C) Deb West, (R) Executive Director Susan Dibble. 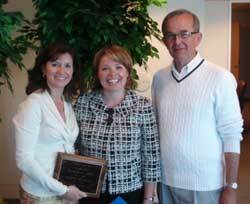 Page Ahead is proud to present the Sarajane Beal Award for Volunteer Excellence to Lorie Day. Lorie Day began volunteering at Page Ahead in early 2009. Her many skills meant that she could take on any task around the office! The job of managing materials for the expanding Story Time program was quickly put in her capable hands. Lorie (left, pictured here with Shana Faulkner) kept up as the number of Story Time volunteers and children grew. She even enlisted the help of her mom to sort through leftover Story Time crafts! Lori did everything from inventory, to creating databases, to picking up (and donating) office furniture. It was because of her help that last year we were able to double the size of our Story Time program, reaching more than 1,200 children in-need. That means more than 1,200 children involved in fun, interactive reading experiences with books, songs & crafts on a regular basis. Page Ahead is proud to present the Sarajane Beal Award for Volunteer Excellence to Sanjeev Narang. Sanjeev’s service to Page Ahead since 1997, when no other volunteer was willing to work with the difficult Lotus program our office was using at that time. He spent his Saturdays learning the program and building us a database, and then helped us convert to a better system. In 2002 Sanjeev became a Page Ahead board member, serving in that capacity for six years. While on the board of directors, Sanjeev headed both the technology committee and the board development committee. In addition to his work on the board, Sanjeev has singlehandedly maintained Page Ahead’s computer network, responding to computer error—as well as user error!—at all hours. Sanjeev’s humor, friendliness, and dedication make him beloved by everyone at Page Ahead. (And it doesn’t hurt that he brings treats wherever he goes!) 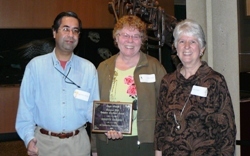 Sanjeev is pictured here at the Volunteer Appreciation Party with former volunteers of the year recipients Diane Koontz and JoAnn Bader. Page Ahead is proud to present the Sarajane Beal Award for Volunteer Excellence to Brooke Graham Doyle. 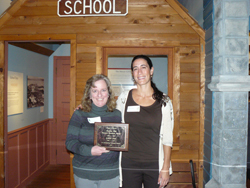 It was with great pleasure that Page Ahead presented Brooke Graham Doyle with the annual Sarajane Beal Award for Volunteer Excellence at a Volunteer Appreciation party held at the Burke Museum in November 2008. Brooke (second from right, pictured here with Board President Sarah Jane Gunter, Executive Director Susan Dibble, and Board Vice-President David Hensel) was a member of Page Ahead’s Board of Directors from 2002 through 2006. During that time, Brooke served as secretary and chair of the Program committee. Since leaving the Board, she has (thankfully) continued as Program chair. Brooke’s expertise in program evaluation and children’s literacy are invaluable to the organization. With her unflappable nature and terrific sense of humor, Brooke is an extremely well-respected and well-liked member of Page Ahead’s volunteer community. Thank you, Brooke, for all you do in helping Page Ahead create a love of reading among the children of Washington State. Page Ahead is proud to present the Sarajane Beal Award for Volunteer Excellence to Elaine Denslow. Some people find ways to go above and beyond what is expected of them. Elaine Denslow is one of those people. Elaine (left, pictured here with Executive Director Susan Dibble and Board President Gene Leonardson) began volunteering with Page Ahead in 2005, bringing her two boys along as she helped us prepare for our community fundraiser, Dish Up Literacy. She was also one of the first Story Time volunteers to be trained to present books, songs, and crafts to classrooms on a regular basis. For three years, Elaine visited Cascade Elementary in Renton every month. But while most volunteers visit one or two classes, Elaine took on four or five at a time! During her years as a Story Time volunteer, Elaine provided fun, consistent, and positive reading experiences for more than 260 kindergarteners. In addition to this work, Elaine also hosted a table at Page Ahead’s annual A Taste for Reading benefit luncheon. Thank you, Elaine, for giving so generously to children in need! Page Ahead is proud to present the Sarajane Beal Award for Volunteer Excellence to Jessica Young. Jessica began her service to Page Ahead in 2003 as an AmeriCorps member. After her AmeriCorps term ended, she continued to volunteer her time at Page Ahead. While her generosity and talents are endless, the staff at Page Ahead is particularly thankful that Jessica shared her technological skills, positive attitude, and infectious laugh with us. Thank you, Jessica! Mary Jo Bruckner received the annual Sarajane Beal Award for Volunteer Excellence at the January meeting of the Board of Directors. Mary Jo (pictured here with Executive Director Sam Whiting) served on Page Ahead's Board until 2005 and is still active as a volunteer. Mary Jo is also quite involved in her community on Mercer Island as a parent, speech pathologist, and volunteer. Her ability to work hard, commitment to living a balanced life, and dedication to improving the lives of others is inspiring. During her Board tenure Mary Jo spearheaded the effort to create our signature fundraising event, A Taste for Reading. The fundraising goals have been surpassed by at least 10% each year it has been held. The 2006 event was held at the Triple Door in downtown Seattle. "I had my first experience with books written specifically for young people at the age of 14. I was babysitting and stumbled upon the "Cherry Ames" series in which the heroic nurse saves the day. Inevitably I was led to the Nancy Drew mysteries. These were easy reads, and I was done in a flash. Of course, I wanted more. More wasn't easy to come by in the small town in Wisconsin where I grew up. There was no bookstore. My school had no library. My education was 'no frills' and I found textbooks dull. That scarcity may account for my love of language, especially as used by Shakespeare. I was captivated by the language of his plays. Rich, layered, full of nuance and humor. I also love Jane Austen; the way she uses language to paint pictures and define characters. You practically feel their presence. I received my primary school education in a world very different than the one we live in now. In the late 1930s children received little personal attention from a teacher. Kids who could not read well were considered slow. Hinderances—poor vision, dyslexia—weren't commonly considered. There wasn't much effor to discern the special, unique interest and talents of children and to appeal to those interests through literature. I like Page Ahead's approach: supplying kids with new books and with the opportunity to choose those books. As a young adult, I began to see touring productions of musicals. I found I had no trouble suspending disbelief. Literature and theatre are somewhat similar: in books, you see the action in your head; in theatre, you see it on stage. My life has given me lots of practice in living in my mind, which gives me an easy ability to enter the world of fiction. I have placed myself smack dab in the center of Seattle, because of access to the cultural opportunities that feed my soul. Shakespeare performed on a bare stage—what could be better? Well, perhaps cheesecake at intermission." Fairy tales aren't the only place you're likely to find a wizard. Page Ahead has its own "techno-wizard." 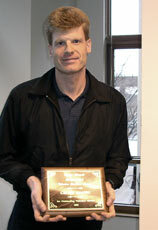 In December, Page Ahead named Calvin Haavig its Volunteer of the Year in recognition of the time and talent he contributed to managing and upgrading our computer systems. While Calvin has performed these services for several years, he was especially critical to the success of Page Ahead's office relocation. Calvin is a long-standing member of Page Ahead's technology committee, a group of volunteers who are committed to combining technological literacy with children's literacy. "At a time when resources for non-profit social service organizations are short, operating as efficiently as possible is essential," said Volunteer Coordinator Jacki Crowther. "Calvin has worked long and hard to make sure Page Ahead is equipped to do just that." 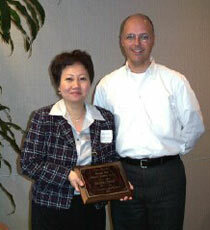 Meena Cheng was honored for her innovative fundraising efforts on behalf of Page Ahead. For the past five years, Cheng and her committee of dedicated volunteers have hosted "Cooks for Books," a dinner, cooking demonstration, and auction that features prominent local chefs preparing their specialties using local ingredients. Meena is a Certified Financial Planner with more than 20 years of experience in the financial industry. She has practiced public and private accounting as a CPA and is currently an Assistant Vice President of Investments for U.S. Bancorp Piper Jaffray. An experienced public speaker, Meena has spoken to companies, universities, and conferences. Meena is also a culinary aficionado who has owned two restaurants and has written the popular book, "Fortune in Your Cookies," a humorous analogy between cooking and investment strategies. 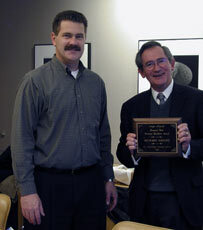 Richard (right) began voluteering for Page Ahead in 1991, shortly after his wife, founding director Keltie Wright, assumed leadership of the organization. A computer systems analyst by trade, Richard put his considerable skills to work as a volunteer. With equal amounts ingenuity and determination, he single-handedly built a technology infrastructure for Page Ahead—increasing hardware from one computer to eight and introducing new software. In addition, he trained all staff and provided technical support from his home in Hawthorne Hills. His calm and level-headed approach to troubleshooting earned him the affectionate title of "one-man help desk and first-aid station."